Helm: This film was a travesty. Dumas is rolling in his grave. They have taken so many liberties with the story that its virtue is completely compromised. Mathew: I enjoyed it. It was a swashbuckling romp. Helm: You are a hoddypeak. Helm: A fool. A simpleton. A blockhead. Mathew: Great. Look, Helm, you can't write this film off just by calling me names. It was fun! 2. A hot babe in her scanties (Mila Jovovich). 4. Sword fighting on rooftops. 5. Sword fighting with four guys versus a whole army. 6. Sword fighting while swinging from ropes. 7. A bad guy with an eye patch. 9. Airships designed by Leonardo DaVinci. 10. Scubadiving dudes in armor. 11. Indiana Jones style traps. Helm: STOP! STOP! I cry foul! 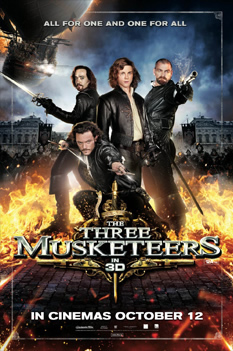 2, 5, 8, 9, 10 and 11 are not elements of The Three Musketeers! That is over half of the elements in question! I have read the book repeatedly. None of these things appear in it anywhere! Mathew: So now you're going to split hairs about a few minor historical details? Mathew: Dude. It is so rude to yell when you are talking telepathically. You're hurting my brain. Helm: I question that you actually have any brain to injure. Mathew: Look. So they played a little loosey-goosey with stuff. It was fiction to start with. It's not like the movie was called European History 101. It's not like the characters were real guys or anything. Mathew: The film was a re-imagining. Like a steampunk version of The Three Musketeers. Helm: Then they should have re-imagined the title. Perhaps they could have called it The Steam Punketeers, or The Three Anachronists, or The Fake Past. Mathew: Whatever, you spoilsport. What do you give the movie? Mathew: I didn't mind a little messing with the past. Helm: Even if I could forgive that transgression, what of the casting of D'Artagnan? The shaggy headed child they used was inexcusable. Mathew: I thought he did okay. Helm: You thought Louis XIII was fictional. Mathew: Touché. But it was still fun. Helm: It was a trifle fun.